What is a Descending Top Pattern? Descending tops develop when the price action produces lower tops between swing lows. As the tops are lowering with each successive move, a bearish trend is forming right before your eyes. Therefore, traders use descending tops to enter short trades. To identify a descending top pattern, you first need spot at least two tops on the chart, which are descending. Then you draw a line connecting these tops. If you manage to do this, you will have a bearish line, which you can use to project the price movement lower. Let’s now walk through how to trade the descending top pattern. The entry point for the descending top pattern is fairly straightforward. After identifying the first two tops, you will need to wait for a third test of the downtrend line. On this reaction higher, you will want to enter a short trade on the down trend line. You should never enter a descending top trade without a stop loss order. What if the price action moves quickly against you? 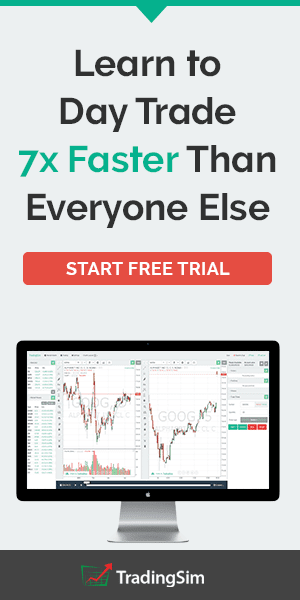 What if the company you are trading releases a positive data and the price bounces to the roof? For this reason, you should always be protected with a simple stop loss order. The good place for your stop is above the third top. There are two options for exiting a descending top trade. The first one concerns the usage of a bearish trend line. The second one is related to the descending tops on the chart. If you are able to draw a bearish trend line through your descending tops, your trade exit will be very easy to attain. Simply stay in your trade until the price action closes above the bearish trade. 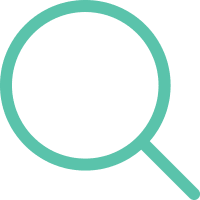 If you are unable to draw a trend line due to uneven descending tops on the chart, you have a second option to exit your trade. Carefully follow the price action on the chart and close your short trade when you see an ascending top on the chart. In other words, if the price action breaks the level of the last top on the chart, you exit the trade. Above is the 5-minute chart of Netflix from July 21, 2016. The image starts with the beginning of a selloff and ultimately a confirmation of a descending tops pattern (3 black arrows). 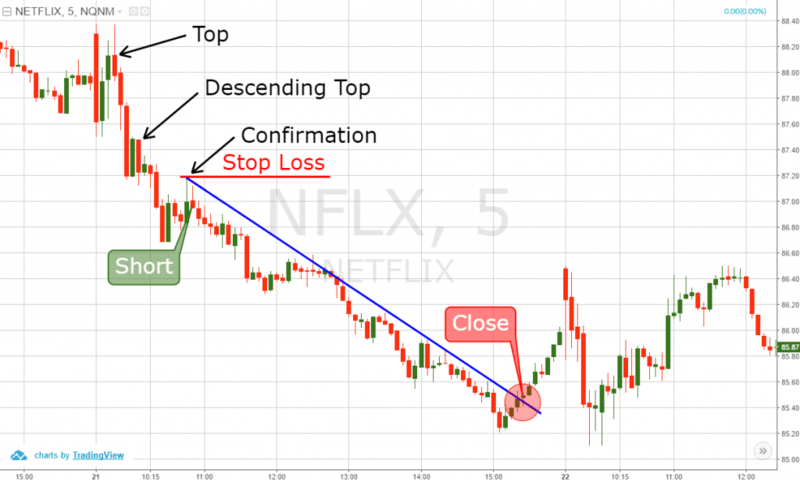 After the pattern is confirmed, we short NFLX and place a stop loss above the confirmation (third) top. The price starts decreasing afterwards and a bearish trend line is created (blue). We stay in the trade until the price action breaks the bearish trend line in a bullish direction. 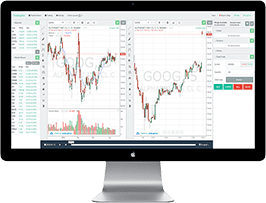 Now that you are familiar with the descending tops pattern, I will now show you how to combine the pattern with two additional trade indicators. This is a trading strategy where we use the descending tops in a combination with the channel indicator. 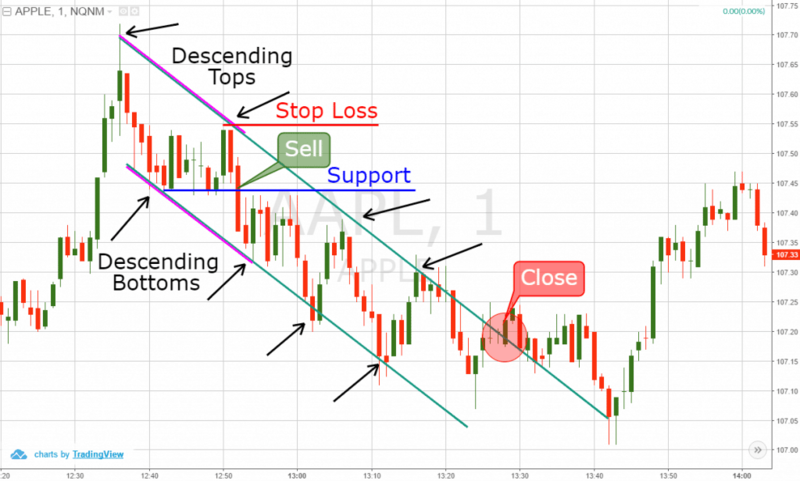 The descending tops channel trading can act as a leading indicator for opening short trades. The first thing you need to identify on your chart to enter a trade is two tops where the second is lower than the first. Notice that we are only using two descending tops and not three as before. You will then need to identify the bottom between the two tops and draw a horizontal support line. You can then use a break of the support line as a trigger for opening the short position. Since you have two descending tops on the chart you are able to draw a bearish line. Once the price breaks the support line, you can then draw the support line for the pattern. The downtrend line of the two tops and the support line of the lows creates the downtrend channel. A good place for your stop loss in this strategy is above the second top on the chart. As the stock continues to make lower lows, you will want to place your stop above the most recent high. As you know, you cannot stay in your trades forever. Therefore, we will now approach a way to exit a descending tops channel trade. Simply follow the price behavior on the upper channel level. 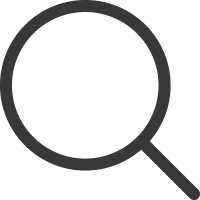 Whenever you see a candle closing above this level, you should exit your trade on an assumption that the price might reverse. Above is the 1-minute chart of Apple from December 22, 2015. The image shows a descending top channel trade. See that we have marked the bottom between the two tops with a blue horizontal level. This is our support, which is the trigger for our short trade. If the price breaks this level downwards, there is a high likelihood the price will create a lower low on the chart. We place a stop loss above the last top as shown on the image. The price then drops and creates a lower bottom, thus confirming the bearish channel on the chart (pink parallel lines). The channel continues further and the price bounces up and down. The interactions with the channel levels are pointed with the black arrows on the chart. We hold the trade until the price closes above the upper level of the descending channel. This happens in the red circle on the chart and we exit our short trade. Another descending top trading strategy is to trade the breakout. In other words, you are trading the reversal move at the end of the descending tops pattern. To enter a trade, you should wait until the price action breaks the trend line of the descending tops pattern. 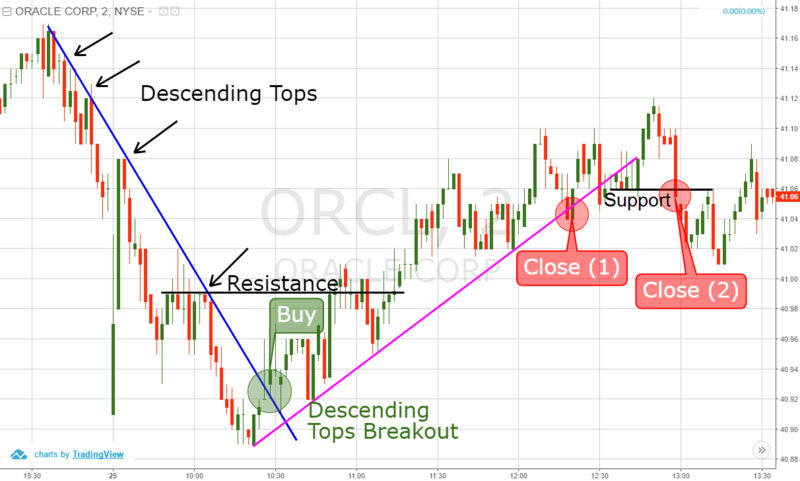 If you are unable to put a straight line through the price’s tops, then you should identify an ascending top to enter a breakout trade. In this case, your stop loss order should be placed below the last bottom on the chart. You should stay in the trade as long as the price is making higher lows. If the price action breaks a bullish trend line – you close the trade. If the price action creates a lower low – you close the trade. Above you see the 2-minute chart of Oracle Corporation. The image covers July 25, 2016. The chart starts with a descending tops pattern, which is marked with a perfect blue bearish trend line on the chart. If you consider the trend line as a reliable indicator, you should buy ORCL as shown on the image. If you don’t trust the trend line, you should buy the stock the moment the price action breaks the black resistance, which marks the last top on the chart. The breakout through resistance creates a higher top. On the way up, the price action enters a bullish trend. We have two alternatives to exit this trade. The first one is to stay until the price action is above the trend line. In other words, you should close the trade when you see a candle closing below the pink trend. If you don’t trust the trend line, then you should hold the trade until the price action breaks the small black support, which marks the last bottom during the trend. This would mean that the price action creates a lower bottom, indicating a reversal. 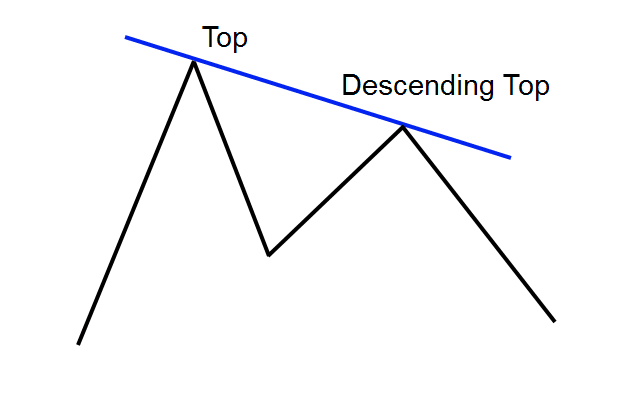 The descending tops chart pattern is associated with bearish trends. To identify descending tops, you need to spot a price top, followed by a lower top. The confirmation of the descending top pattern comes with the third top, which is supposed to be lower than its ancestor.